WALTHAM, Mass. – (RealEstateRama) — October 18, 2016 – The Massachusetts Association of Realtors® (MAR) announced today that Kelly Catallo of Keller Williams Realty in Medford and Lisa Farnworth of Pelletier Realty in New Bedford were named MAR’s 2016 Good Neighbor Award winners for their work on behalf of Boston Children’s Hospital and the Department of Children and Families respectively. The Good Neighbor Award recognizes Realtors® for their community activism. The award was presented at MAR’s Professional Awards Reception, which was held in conjunction with the Association’s 2016 Conference and Tradeshow at Foxwoods Resort and Casino in Mashantucket, CT. In 2013, Catallo started an organization called Foundation of Friends to create community events that support non-profit organizations that make life better for citizens of Medford and surrounding neighborhoods. Her commitment to planning, organizing and fundraising to charitable events earned Catallo a reputation in her community as a “professional volunteer.” When her own son fell ill she put her expertise to work raising money for Boston Children’s Hospital, where her son was treated. For the past three years, Catallo has annually mobilized over 100 volunteers and sponsors to produce a fun run in support of the hospital called the Running of the Leprechauns 5K in Medford. Participants dress in green and enjoy Irish dancing, beef stew and bread after the race. Since its inception, the race has raised over $50,000 for Boston’s Children’s Hospital. 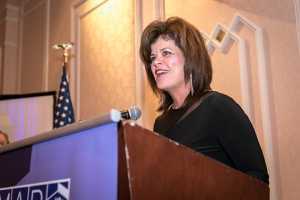 Farnworth first became involved with the Department of Children and Families (DCF) in 2008 when she became an advocate for children within the foster care system. Formally, Farnworth has sat on the DCF Area Board as well as the Task Force for Foster Care Support. She has also created two fundraisers in support of local youth in the foster system in the New Bedford area. One annual event invites members of the community to sponsor a child during the holiday season, making sure foster children who are separated from their families during this time receive gifts and support. Through this event, over 70 children have been matched with individuals and given numerous holiday gifts. Farnworth also founded “Take This Child to Heart,” which raises money for local foster kids to attend summer camps or join youth sports. Established in 2004 and presented annually, the MAR Good Neighbor Award recognizes Realtors® who have demonstrated an extraordinary commitment to community service through volunteerism and civic and charitable contributions that improve the lives of local residents and make their community a better place to live. Entries are accepted from industry practitioners and the 14 local Realtor® associations in Massachusetts, and selection of the award recipients is made by a sub-committee of the MAR Communications & Public Relations Committee. The award recipient receives a commemorative trophy and a grant from the Massachusetts Association of Realtors® in the name of their designated charity. Organized in 1924, the Massachusetts Association of Realtors® is a professional trade organization with more than 22,000 members. The term Realtor® is registered as the exclusive designation of members of the National Association of Realtors® who subscribe to a strict code of ethics and enjoy continuing education programs.